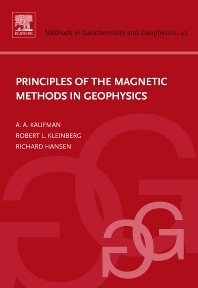 Magnetic methods are widely used in exploration, engineering, borehole and global geophysics, and the subjects of this book are the physical and mathematical principles of these methods regardless of the area of application. Beginning with Ampere's law, the force of interaction between currents is analyzed, and then the concept of the magnetic field is introduced and the fundamental features are discussed. Special attention is paid to measurements of relaxation processes, including topics as the spin echoes or refocusing. Also the special role of the magnetic method in the development of the plate tectonic theory is described. covers all the physical and mathematical principles of magnetic methods regardless of the area of application. presents thorough developments of magnetic methods. Introduction. 1. Magnetic field in a nonmagnetic medium. 2. Magnetic field caused by magnetization currents. Magnetic field in the presence of magnetic medium. 4. Main magnetic field of the earth. 5. Uniqueness and the solution of the forward and inverse problems. 6. Paramagnetism, diamagnetism and ferromagnetism. 7. Nuclear magnetism and measurements of the magnetic field.